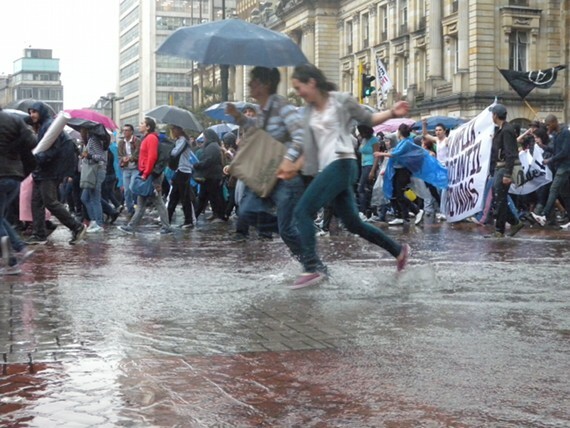 A downpour didn’t stop students from filling the streets of the main cities of Colombia yesterday. The biggest protest took place in Bogotá, where around 20,000 people walked for hours until reaching Bolivar Square. A day earlier, President Juan Manuel Santos tried to deter protesters by offering to withdraw the privatization bill they oppose once universities go back to normal academic activities. His offer was not convincing. The students once more decided to press on until the government and minister of education withdraw the proposed law. The protests at least managed to frighten the ex-vice-president Francisco Santos, a relative of the current president. In a private interview, he expressed his surprise about the lack of authority that President Santos has shown in confronting the students. He feels that is time to use stronger force against them. At least 22 students were detained. Media coverage of the protest was, as it usually is, very poor. The private national TV channels insisted on analyzing the traffic jams it produced and used the most violent footage they could when referring to it. They neglected to mention than the student strike has won support from high school students, parents, professors and some labor unions. Still, with cities around the country shut down for a day, this nonviolent movement showed how widely Colombians hold the conviction that the defense of education is a public good.